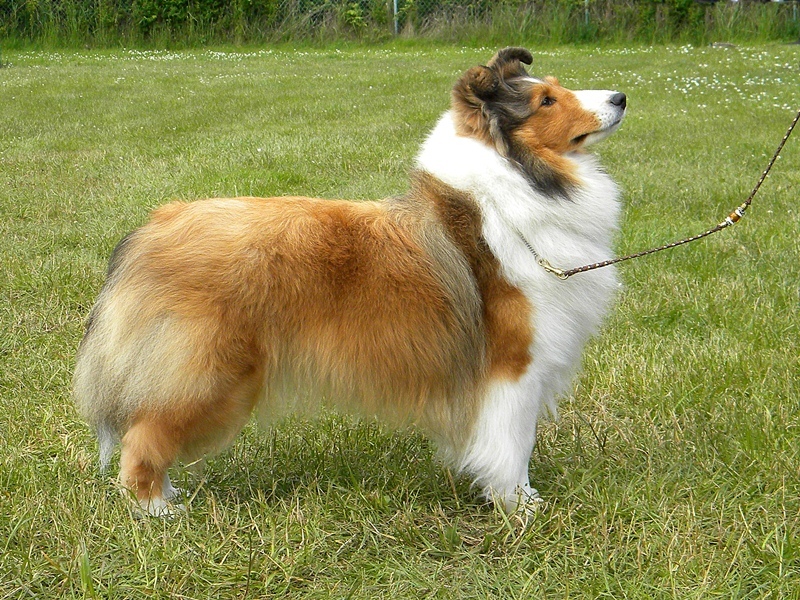 The standing picture shows a female sheltie in her prime, with full lush coat. Expression and stance is alert and eager, ready for direction. Ears must be semi-erect and front facing to catch your every verbal command. Smooth, clean head planes, nice arch of neck, good shoulder placement, shorter length of back with a level topline, gently sloping to the tail, and back legs with good bend at the stifle and shorter hocks….all these are things are what judges look for when evaluating how the dog is built and if they are built according the the standard for that dog, and for the work it was originally bred to do…which is herding livestock, or as a watchdog for crofters gardens and farmyard animals. They must be sturdy, but not too overdone, and certainly not fine boned both of which would not enable them to work tirelessly all day in rough terrain. The Shetland Sheepdog..or Sheltie… come from the wild Shetland Islands, where many of the animals, including cattle, horses and sheep, are built in “miniature” in order to survive and thrive in an often harsh environment. The Sheltie is often placed with it’s herd of sheep in isolation on a small island for the sheep to find graze for the day. They must be alert, agile and strong to remain on the watch for their herd while the shepherd is tending elsewhere. Shelties are eager to please their master and must reflect that eagerness when they are shown in conformation. Their intelligence makes them excellent obedience dogs, and their agile nimbleness make them keen agility champions. And their conformation (skeletal and musculature structure) must all come together in the right way for the Sheltie to be able to move effortlessly in an extended trot for long periods of time. Their movement should be smooth and effortless, not choppy or short-stepped. The picture of Desi moving alongside me is a perfect picture to demonstrate this effortless and ground eating stride. The back legs must “drive” the body forward with power while the front legs must “reach” forward to grasp the ground ahead. This is an extended “trot” that is demonstrated by the picture. When all four legs are in proper action, they present the look of a flattened and elongated letter “M”. 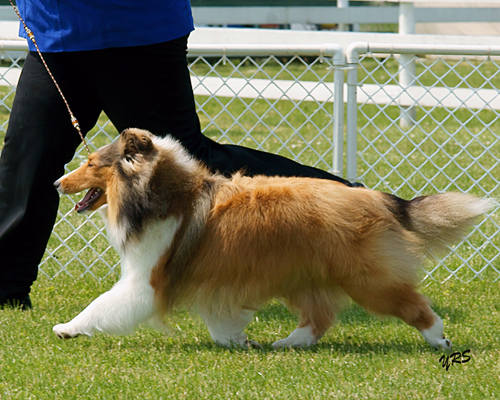 In a conformation dog show, the judge will examine the Sheltie on a table – hence they are known in the dog show world as “Table Dogs” – in order to examine the structure of dog, as to bone and muscle placement of the body and legs, head planes, ear and eye placement. Then they will have you move the dog and evaluate the back movement as the dog is moving away from the judge as well as the front movement as the dog comes toward the judge as well as the side movement as the dog is taken around the ring. All this shows the judge as to whether or not the shoulder and rear placement of the legs come together properly so that the dog moves properly without too wide of a gait, too narrow of a gait, or too short of a gait ( all of which would tend to cause the gait to be “sloppy” or “choppy” with unnecessary up and down motion which would tire the dog out. Then the judge will evaluate your dog in a “stacked” position on the ground, like the first picture of Desi standing. This position is usually helped along by “baiting” the dog with treats in order to bring out the eager expression and stance that Shelties need to have in order to project their readiness to work.